MOUNT CARMEL - Clement J. "Click" Plisiewicz, Sr., of 222 South Locust Street, peacefully passed on with his family by his side on Tuesday, February 26, 2008 at the Shamokin Area Community Hospital after a brief illness. Born in Ranshaw on September 25, 1920, he was the son of the late Andrew and Julia (Noval) Plisiewicz. He attended Mount Carmel Area High School for two years before having to resign to work in mining. After serving his country in the military he graduated from the Philadelphia Institute of Barbering on September 5, 1950. 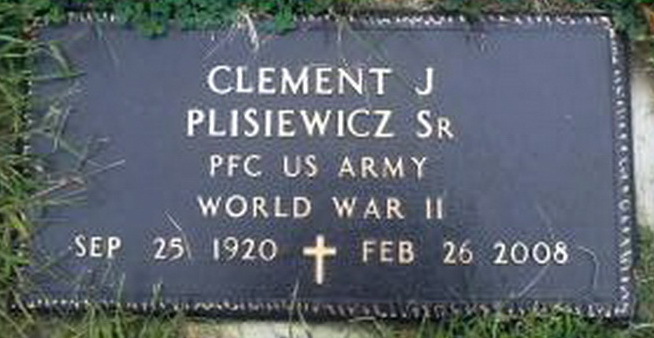 Clement was a World War II Veteran having served in the U.S. Army. He enlisted in 1942 and was discharged April 23, 1946. He was reported as missing in action on March 24, 1945 and was rescued by the British and returned to his unit 30 days later. He was awarded the European African Mid-Eastern Campaign Medal, the World War II Victory Medal and Good Conduct Medal. On November 27, 1948 in the former Our Mother of Consolation Church, Mount Carmel, he married the former Helen Elizabeth Buczynski, who survives. He devoted his life to serving veterans. He was employed by the Wilkes-Barre Veterans Administration as a Service Officer prior to being elected in 1972 as Quartermaster for the PA State VFW, Harrisburg. He was reelected every year thereafter to that office at the VFW state conventions for which he served until his retirement in 1987. He was an active member in his community and has received numerous awards to local, state and national level for his 60 plus years of service to the VFW and his community. He was an active member of VFW Post 2110 where he served as Post Commander and Post Quartermaster for many years. Survivors include his wife, Helen; two sons, Clement J. and MaryAnn Plisiewicz of Mt. Carmel, Edward and Nina Plisiewicz of Trevorton; seven grandchildren; nieces and nephews. He was preceded in death by a grandson, Clement Plisiewicz III, three brothers, Bill, Al and Chester, two sisters, Adelle and Camille. Funeral Mass will be held Friday, February 29, 2008 at 11 a.m., in Divine Redeemer Church, 300 West Avenue, Mount Carmel, with Father Robert Yohe officiating. Burial will be in Our Mother of Consolation Cemetery, Mt. Carmel Twp. Viewing will be held Thursday evening from 6-9 p.m., with a Christian Wake Service at 8 p.m., and Friday morning from 9:30-10:40 a.m., in the C.J. Lucas Funeral Home, Inc., 27 North Vine Street, Mount Carmel, C.J. Lucas, IV, Supervisor. 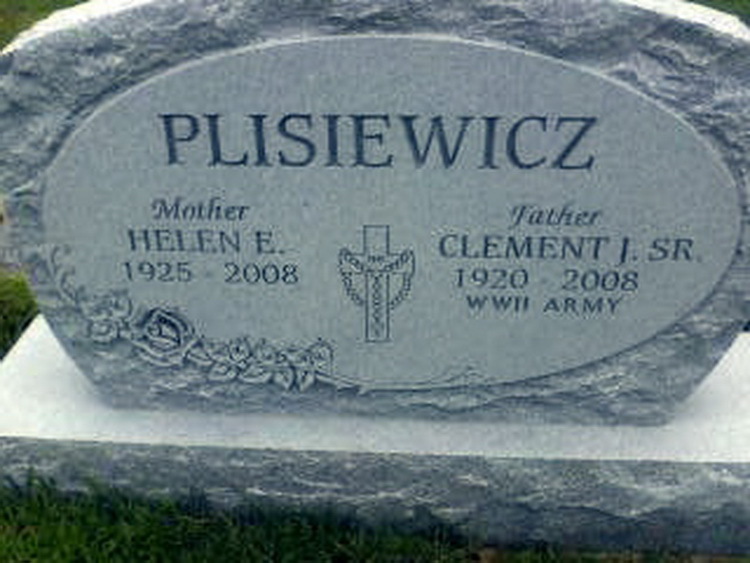 Grave markers for Clement J. Plisiewicz, Sr. in Mother of Consolation Cemetery, Mount Carmel (Northumberland county), Pennsylvania. Clement enlisted at New Cumberland, PA 2 August 1944. Pfc Plisiewicz was transferred from Hq 82nd Airborne Division to Company D, 508th PIR on 13 October 1945.